Sister Stanislava was born in Belene, northern Bulgaria on March 19, 1924 from a devout Catholic family. She grew up among three brothers and one sister. She studied primary school and gymnasium in her birthplace. Upon the invitation of her aunt, Sr. Gertruda Dobranova, who was a Benedictine Sister of Tutzing, she came to Zarevbrod at the age of fifteen. After entering the convent on July 20, 1938, she was first accommodated for two months together with the poor children. She felt sad and homesick and cried all the time and was not able to stop. Then she was accepted in the community on October 18th, 1938 and suddenly all the sadness and tears disappeared. Sister magistra Amata Herz replaced the parents in her heart. She taught the girl German every day and in May 1939 the future Sister Stanislava took an exam and completed the course successfully. On September 15th she was enrolled in the German school of the Vincentian Sisters in Sofia. She graduated from high school five years later in 1944 with a score of 5.48. The students only attended school until Christmas, because the old church and the school were destroyed by the bombings. In the summer of 1944, she applied to the University of Shumen. She wanted to study Bulgarian philology but got a refusal because she was a Catholic. The thirteen German Benedictine sisters from Tsarev brod and two Sisters from Bardarski Geran left the country on September 3rd, because the Soviet Army invaded Bulgaria. Good magistra Amata also went to her home country. That was a critical moment in Sr. Stanislava’s life. She did not know what to do. However, God’s providence helped her. Some of the sisters had remained in Bardarski Geran and then their magistra was Sister Benildis. After three years, on May 6, 1947, Anna became a novice and received the name of Sr. Stanislava. One year later, on May 8, 1948 she made her temporary religious vows, and on October 3, 1951, at the feast of Saint Therese of the Child Jesus, she made her perpetual vows. Both feasts were concelebrated by the right reverend martyr, the Blessed Bishop Evgeni Bosilkov. It was a happy coincidence for Sister Stanislava that he was the one who heard, accepted and signed her profession card. Those years were tough years for the Sisters. They could not pay to the totalitarian government the required produce from the fields. On December 12, 1950 a psychiatric hospital was opened in Zarevbrod in the convent compound and six of the sisters were hired there. Sr. Stanislava worked in Dr. Danov’s office for three and a half years. During the next 25 years she worked in the hospital as a labor therapist and retired on May 1, 1979. After retiring from work, she was appointed Superior of Zarevbrod for two terms, from 1988 to 1994. Her tasks included the difficult restoration process of the confiscated monastery’s properties. Meanwhile, the Sisters advanced in age and it was prohibited to recruit new members. God’s providence brought two German Sisters who came to help the Bulgaria mission in 1992, but they had first to study the language. After finishing her second term as Superior, Sr. Stanislava was able to go on vacation outside of the country. She was also tasked to write the history of the Bulgarian mission. This led her to Rome and Tutzing in Germany. In 1996, Sr. Stanislava was sent to Russe to do pastoral work together with her aunt, Sr. Gertruda. She stayed there for three years. Upon her return, she continued writing the mission history aside from the house assignments entrusted to her, which she did with diligence and enthusiasm. Sr. Stanislava was invited in 2001 by Fr. Josef Misera (a Polish Franciscan Priest) to the First Festival of Youth in Belozem where she delivered a speech about her vocation and witnessed in front of the young people. She found it wonderful that she was speaking fluently without having prepared her speech in advance. At the end she said “I try not to betray my groom Jesus. I am a happy nun and a happy Benedictine Sister”. In 2011, Sr. Stanislava suffered a stroke and from then on became bedridden. She bore her sufferings until February 6th when after breakfast she quickly breathed her last in the presence of the community. 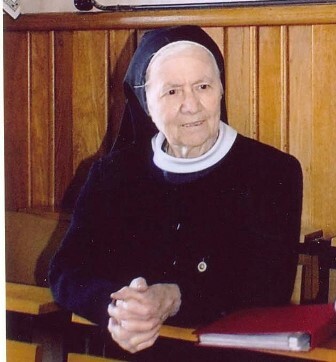 Sr. Stanilava was a woman of prayer. She took time to be in the chapel early for meditation and prayer. We recommend Sr. Stanislava to your prayers.